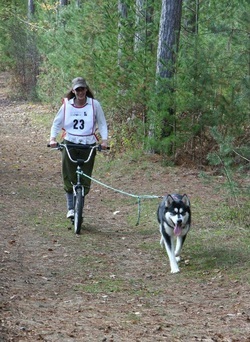 Above Photograph: Tinker dryland carting with two Siberians and a Malamute Fall 2011. The below sections have help that would apply to both the Alaskan Malamute and any other dog breed about dog scootering, working training, wins at working events (and events), club events, working pictures and working races with my Alaskan Malamutes on dog scooter. 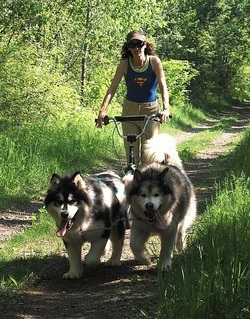 Since my very first Alaskan Malamute, Yukonjak's Tala, I have biked the dogs. Tala could easily do 15 miles a few times a week. I never did any working, racing or competition events with Tala. But as each new 'Alaskan Malamute' arrived, I needed to find something that would cut down my work, and keep the dogs happy so I finally bought a dog scooter, the one pictured below. All my dogs since Tala, have been started out fairly young. Before Bert was hurt, Bert and Ernie would dog scooter together. In Tinker's first year of life, I had more than 100 excursion miles on her from only the Summer. Unfortunately, Tinker decided she didn't like her mother anymore but Ooky can dog scooter with Ernie or Ernie can go with Tinker. Ms 'Goes Like Stink' (Tinker) acquired the nickname because that's what she does - and she has gold and silver wins in dryland dog scooter race events competing at our working club competition events for her speedy efforts. Many Alaskan Malamutes compete in this club at various events. Ernie can always finish a working race event - and never comes in last - but, true to his Alaskan Malamute heritage, definitely doesn't win a gold at a race with his speed! Ooky usually comes in second or third at a scooter race event so she has some nice wins, too. She does have a few gold on scooter, as well. She is a very consistent Alaskian Malamute when running. If you are looking for help, events and working training for Alaskan Malamute do scootering check out this Dog Scooter link. You can start to train your Alaskan Malamute puppy for things like scootering or sledding as soon as you have the dog. Desensitizing to the harness, sounds, equipment, different locations will be good for the puppy - regardless of whether you work the dog seriously, or not. Hopefully the breeder exposed it to things necessary for 'working' - sound, equipment, being tied out, etc. If not, you can do all these things. For my last three dogs, I've been running them, with an older dog, when they reach about four months. Considering I weight 100 pounds, it's not an extreme amount of weight. Let common sense dictate what you should be doing with the puppy; age, condition (some puppies are overfed at the breeder and thus, already in trouble as far as developing hip dysplasia; and not 'exposed' to things. Don't put extremely heavy objects on a young, untrained dog. Don't expect to go for miles and miles with a young dog. Just keep it fun for them. Using an older, controllable dog to train your puppy with, works perfectly. The older dogs usually already know the commands. The younger dogs simply follow along - and learn pretty quickly. And - and I can't repeat this enough - if there is any question that your dog might have hip dysplasia, DO NOT do any serious working or running with them, until you can have their hips certified. If the parents did not have their hips certified, assume there could be a problem. Exercise and hip dysplasia have been studied extensively for decades. Excersise does NOT cause hip dysplasia. Hip dysplasia is genetic (inherited) BUT can be aggravated by exercise, overeating, being overweight, being fed incorrectly, and excessive jumping. Alaskan Malamute dryland scooter race Tinker, 10/10 - silver - 6.4 km - her first race! Alaskan Malamute dryland scooter race Tinker, 11/10 - GOLD - 6.4 km! Ooky, 6, and Ernie, 9, running with the wind, May 2011. Dryland Carting side view. Tinker is in her pink harness, center.